Java is an island of Indonesia. With a population of over 145 million, Java is home to 57% of the Indonesian population and is the most populous island on Earth. The Indonesian capital city, Jakarta, is located on western Java. Much of Indonesian history took place on Java. It was the center of powerful Hindu-Buddhist empires, the Islamic sultanates, and the core of the colonial Dutch East Indies. Java was also the center of the Indonesian struggle for independence during the 1930s and 1940s. Java dominates Indonesia politically, economically and culturally. Formed mostly as the result of volcanic eruptions, Java is the 13th largest island in the world and the fifth largest in Indonesia. A chain of volcanic mountains forms an east–west spine along the island. Three main languages are spoken on the island: Javanese, Sundanese, and Madurese. Of these, Javanese is the dominant; it is the native language of about 60 million people in Indonesia, most of whom live on Java. Furthermore, most residents are bilingual, speaking Indonesian (the official language of Indonesia) as their first or second language. While the majority of the people of Java are Muslim, Java has a diverse mixture of religious beliefs, ethnicities, and cultures. 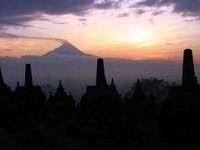 Java is almost entirely of volcanic origin; it contains thirty-eight mountains forming an east–west spine that have at one time or another been active volcanoes. The highest volcano in Java is Mount Semeru (3,676 metres). The most active volcano in Java and also in Indonesia is Mount Merapi (2,930 metres). The area of Java is approximately 150,000 km2. It is about 1,000 kilometres long and up to 210 kilometres wide. The island's longest river is the 600 km long Solo River. The river rises from its source in central Java at the Lawu volcano, then flows north and eastward to its mouth in the Java Sea near the city of Surabaya. Other major rivers are Brantas, Citarum, Cimanuk and Serayu. West Java (Jawa Barat) - Bandung. One of the most densely populated regions on earth, including the massive urban sprawl of Jakarta and the university city of Bandung in the mountains. Still, there are extensive natural areas of impassable rain forest, as well as many active volcanoes and secluded beaches. Central Java (Jawa Tengah) - Semarang. Charming Yogyakarta and significant ancient temples. East Java (Jawa Timur) - Surabaya. Indonesia's second city Surabaya and stunning volcanic scenery. Jakarta - the nation's capital. The Borobudur is a giant Buddist temple complex, built in the 8th and 9th century. The building has nine so-called stupas. The first 5 make up the piramidacal base of the structure, on top of that are 3 circular stoepa´s and finally there is one big stupa on top of all the others. Around the 3 circular stupa´s are 72 open stupa´s with statues of Buddha inside. In the 10th of 11th century the temple was abandoned, and only rediscovered at the end of the 19th, after which the structure was cleared from the vegetation, and finally at the end of the 20th century it was restored with the help of the UNESCO. An hour's drive from the Borobudur Temple are the Hindu Prambanan Temples, which are also on the UNESCO World Heritage list. Mount Bromo is probably one of the best known mountains/volcanoes in Indonesia among travellers. It is an active volcano (latest eruption in January 2011) in the Tengger Massif in the east of the island of Java. It's not the highest mountain in the chain, but at 2,329 metres it's one of the most famous and easiest to excess. It's a very popular hike and although usually without problems, it is not entirely safe. The usual way to visit Mount Bromo is from the nearby mountain village of Cemoro Lawang. From there it is possible to walk to the volcano in about 45 minutes, but it is also possible to take an organized jeep tour, which includes a stop at the viewpoint on Mount Penanjakan at 2,770 metres (this mountain can be reached on foot in about 2 hours if you fancy walking). The best views from Mount Bromo to the sandy areas below and the surrounding volcanoes are at sunrise. Mount Merapi is an active stratovolcano and currently the most active one in Indonesia, erupting regularly for since almost 500 years, most lately in 2010. It's one of the 16 potentially deadliest volcanoes in the world because of its large populations living on or near the mountain slopes. It's just 30 kilometres from the city of Yogyakarta but people are living up to 1,700 metres high on the slopes of the volcano, with the total hight just under 3,000 metres. Although not particularly of interest for travellers (unlike for example Mount Bromo), Mount Merapi sure makes for a great sight and wandering around the villages below the mountain is a nice way of spending an afternoon (if possible!). On top of that, in 2004 an area of 6,410 hectares around Mount Merapi was established as a national park, ironically leading to the fact that fewer people were ready to leave their homes during the 2006 eruption because they were afraid the area would be incorporated into that national park. The Merapi Museum Center in Yogyakarta is of interest, with a replica of Merapi's Post 2010 Eruption. Ujung Kulon National Park is located at the westernmost tip of Java, within Banten province of Indonesia. It includes the volcanic island group of Krakatoa in Lampung province, and other islands including Panaitan, as well as smaller offshore islets such as Handeuleum and Peucang in the Sunda Strait. It is Indonesia's first proposed national park and was declared a UNESCO World Heritage Site in 1991 for containing the largest remaining lowland rainforest in Java. After the 1883 eruption of Krakatoa, many settlements in the park were wiped out and never repopulated. Ujung Kulon stands as the last known refuge for the critically endangered Javan rhinoceros after poachers killed the last remaining rhino in Cát Tiên National Park of Vietnam. The park also protects 57 rare species of plant. The 35 species of mammal include Banteng, Silvery gibbon, Javan lutung, Crab-eating macaque, Javan leopard, Java mouse-deer and Rusa deer, Smooth-coated Otter. There are also 72 species of reptiles and amphibians, and 240 species of birds. Jember Fashion Carnaval or JFC (Indonesian Karnaval Busana Jember) is an annual carnival held in the East Java city of Jember. Officially it is written as Jember Fashion Carnaval; the word carnival here is officially spelled as carnaval, probably a confusion with Indonesian spelling karnaval, or an influence of the Dutch spelling carnaval. Jember Fashion Carnival has no relation with the Christian pre-Lenten festival, but more of a festivities in general, roughly following the Brazilian style, with procession of dancers in extravagant costumes, with emphasis on the traditional Indonesian motif. Generally, the carnival used world-themed fashion or nature-inspired theme. Preparation was held extensively months before and participants volunteered for the event. The Java Jazz Festival held in Jakarta is one of the largest festivals in the country. It only began in 2005, making it one of the newest events in Indonesia, but has quickly risen in popularity. The festival lasts for three days at the beginning of March, and sees dozens of local and international artists display their talent across the capital city. The average temperature ranges from 22 °C to 29 °C; average humidity is 75%. The northern coastal plains are normally hotter, averaging 34 °C during the day in the dry season. The south coast is generally cooler than the north, and highland areas inland are even cooler. The wet season begins in November and ends in April. During that rain falls mostly in the afternoons and intermittently during other parts of the year. The wettest months are January and February. West Java is wetter than East Java and mountainous regions receive much higher rainfall. The Parahyangan highlands of West Java receive over 4,000 mm annually, while the north coast of East Java receives 900 mm annually. Lion Air - from Kuala Lumpur , Jeddah, Riyadh, Ho Chi Minh City and Singapore. Some more destinations with other airlines include Dubai, Xiamen, Manila, Abu Dhabi, Doha, Nanning, Phuket, Istanbul and Sana'a. Bus: A shuttle bus route links the airport to Rawamangun, Blok M, Gambir Station, Bekasi, Depok, Lebak Bulus, Tanjung Priok, Kemayoran, Kampung Rambutan, Pasar Minggu, Serang, Merak, Cikarang and Bogor. Primajasa buses now also serves Bandung from the airport. Car: Depending on traffic, Soekarno–Hatta is a 30 minutes drive away from Jakarta's city centre via Soedyatmo Expressway. Rental cars are available, as well as taxis. 2. Juanda International Airport (SUB) serves as the main gateway with almost 20 airlines flying to/from Surabaya. Destinations include Kuala Lumpur, Jakarta, Singapore, Johor Bahru, Yogyakarta, Taipei, Hong Kong, Bali, Bandung and Bandar Seri Begawan. 3. Husein Sastranegara International Airport (BDO) serves Bandung with flights to Bali, Medan, Kuala Lumpur and Singapore. 4. Adisucipto International Airport (JOG) near Yogyakarta has a few international connections, including flights with Air Asia to Kuala Lumpur and Singapore. There are two key highly frequent ferry routes to Java, operated by ASDP. From the island of Sumatra in the west, ferries operate from Bakauheni in Lampung province to the port of Merak on Java (24 hours per day, multiple departures per hour). From the island of Bali in the east, ferries operate from Gilimanuk to the port of Ketapang in East Java (24 hours per day, two departures per hour). Java is also part of the national PELNI passenger ferry network, with routes to and from all major Indonesian islands. PELNI ships call at the ports of Surabaya, Semarang, and Tanjung Priok port in North Jakarta. Flying is a good option for travelling larger distances in Java. The route from Jakarta in the west to Surabaya in the east is one of busiest flight routes in the world. In addition, there are frequent flights from Jakarta (and Bandung) to other airports in Central and East Java, and for example between Yogyakarta and Surabaya. Apart from these trunk routes, there are smaller routes to more remote airports such as Pangandaran and Cilacap on the south coast, and the outlying islands of Karimunjawa, Madura, and Bawean. Java has the most comprehensive railway network in Indonesia, with trains connecting the capital city of Jakarta with most other cities and towns in the island. The eksekutif class is the luxury class, and consequently the most expensive. Ticket reservations can be made starting 90 days in advance. On-line ticket reservation is available through PT Kereta Api's ticketing site and several other on-line ticket agent websites and also thousands of Alfamart and Indomart mini markets. Travelers can also buy ticket from a ticket agent's shop or local post office which is available in most of all cities in Indonesia. Either buying from internet or ticket shop, travelers will get printable voucher with Rp6,000 additional administration fee and it must be exchanged with the real ticket at the nearest or departure train station. Please remember that your name in the ticket should be same with your identity or you can't get into the train, if the name is different or you must pay double. Java's toll roads are built nearly to Western standards, with dual grade-separated lanes in both directions and elevated interchanges. Tolls are quite affordable, usually Rp 1,500-5,000 every 10 km or so. However, signage is often lacking and driving habits are atrocious, so it's very wise to pay a little extra and get a car with driver instead of attempting to drive yourself. The main form of long-distance transport, vast armadas of buses cross the island and connect every city and mountain hamlet. Watch out though, as many drivers have near-suicidal driving habits that emphasize speed above all else. There are two type of buses, with aircon and without aircon; the fare of non-aircon is only about a third of using aircon. If you do take a bus, take one with aircon, because drivers of such buses are known to be safer, as a general rule. For long trips, people tend to use cheap airlines, because their fares are usually comparable to bus fare. However, in peak season, even 'cheap airlines' fares increase to 3 to 4 times the cost for air conditioned buses. Boiled water or drink water from a sealed bottle. Tap water is not drinkable, except boiled or is filtered by small purifier. Coffee or tea, it's safe. The same applies to beer, which combines very well with hot Indonesian cuisine. Beers are relatively cheap, but other alcohol drinks with more than 5 percent alcohol are relatively expensive due to taxation. We have a comprehensive list of accommodation in Java searchable right here on Travellerspoint. You can use our map to quickly compare budget, mid-range or top of the range accommodation in Java and areas nearby. I am Dutch, but I have lived 26 of my now 75 years in Java. Presently with my wife I settled in Spain. As we lived and worked there, we know many places in Java that your typical mass tourist passes by. Our interests are history, culture and unspoiled nature. I am open to any questions, if your travelling style is off-the-beaten path. This is version 26. Last edited at 19:22 on Feb 13, 19 by theo1006. 37 articles link to this page.